Notes: Former Tomahawks' goalie Jake Moore now playing for the Springfield Pics. The regular season is fast approaching for the Tomahawks. The season gets underway vs the Keystone Ice Miners on September 13th, at Keystone, but before that first match-up of the 2014-2015 season begins, the Tomahawks will take to the ice in a couple exhibition games. Those first two exhibition games will take place this weekend with the Springfield Pics of the USPHL.Sure the two games don’t mean anything in either team’s standings but there is a lot on the line nonetheless. 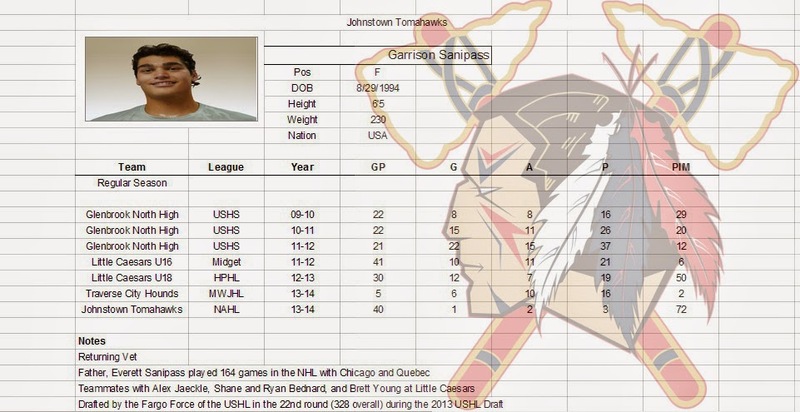 This will be a time that players will show if they have what it takes to officially become part of the Johnstown Tomahawks. This will be the first time we get a feel for how new coach Mike Letizia runs his team on the ice. This will be the first time we get to see a former player, in Williams, return to Johnstown to stand by Letizia’s side as the new assistant coach. This will be the first time that the Tomahawks have skated on the ice without a few of their veterans, like Jordan Watt, Brandan Reinholz, and Cody Bentzel. All three of those players were part of the Tomahawks inaugural season. This will be the first time to see players like Zach Zech and Dalton Hunter skating vs an opponent other than their own teammates in scrimmage games. In Between the pipes we’ll see returning goalie Brett Young, joined by newcomers Jake Gwillim, and Ryan Bednard. This will be a good weekend to get back into the swing of things and get even more eager to begin another year in the NAHL. Now matter the final, this will be a good weekend, because the hockey is back. 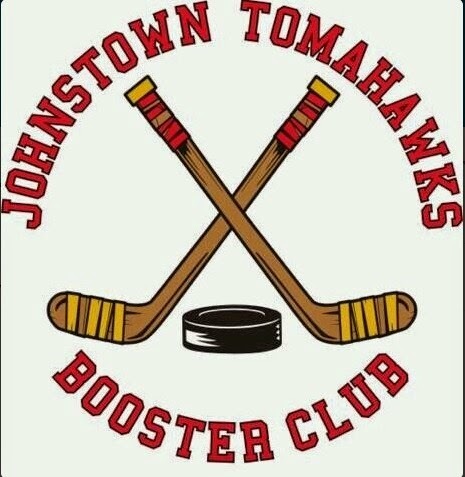 ---Last exhibition season the Tomahawks and Pics played a game against each other with Johnstown coming out on top, 4-2. You can see that game’s recap along with the three others games that were played here. 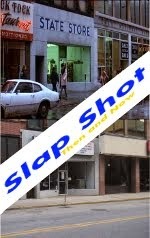 You can also read our exhibition wrap-up we wrote for Juniorhockey.com here. 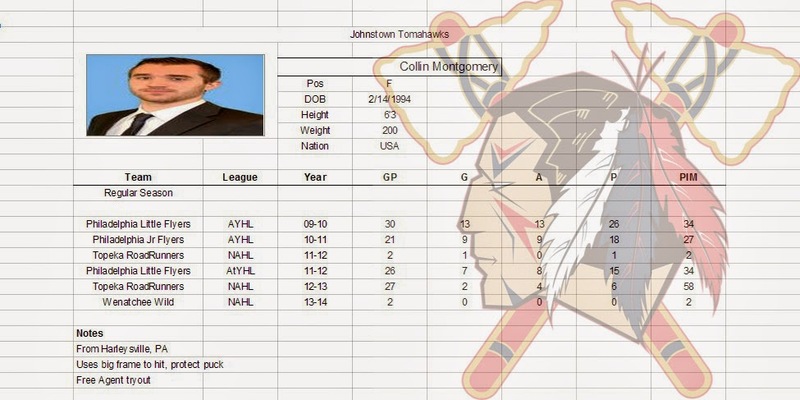 JOHNSTOWN, Pa – The Johnstown Tomahawks had to look no further than their recent past in their search for the team’s new assistant coach, tabbing former player Matt Williams for the position as the team began training camp activities this week. Williams, who was traded to Johnstown late in the Tomahawks’ inaugural 2012-2013 season, fills the vacancy left by Mike Letizia’s promotion to head coach in June. Following his tenure with the Tomahawks, Williams played at Lake Forest College near Chicago and transferred to Western Michigan shortly before being diagnosed with Hodgkins Lymphoma last year. With the cancer now fully in remission, Williams said he is excited to begin the next phase of his hockey career. Letizia said he expects Williams to bring many of the same attributes he had as a player to his new role. “When we traded for him, he was a leader from the first time he walked into the locker room. Everyone looked up to him and followed his lead when it came to his character and his approach to the game, on and off the ice,” he said. General Manager Rick Boyd said Williams stood out as a strong coaching candidate because of his performance not only as a player, but as a volunteer helping with camps after his NAHL eligibility had expired. In his new role, Williams will assist players with on- and off-ice player development and conditioning, as well as coordinating game plans and practice plans with Letizia. The Tomahawks begin the regular season on the road Sept. 13. Johnstown’s home opener is Oct. 25 against the new in-state rival, the Keystone Ice Miners. Season ticket packages are available now, with 14-game flex plans starting at under $99. 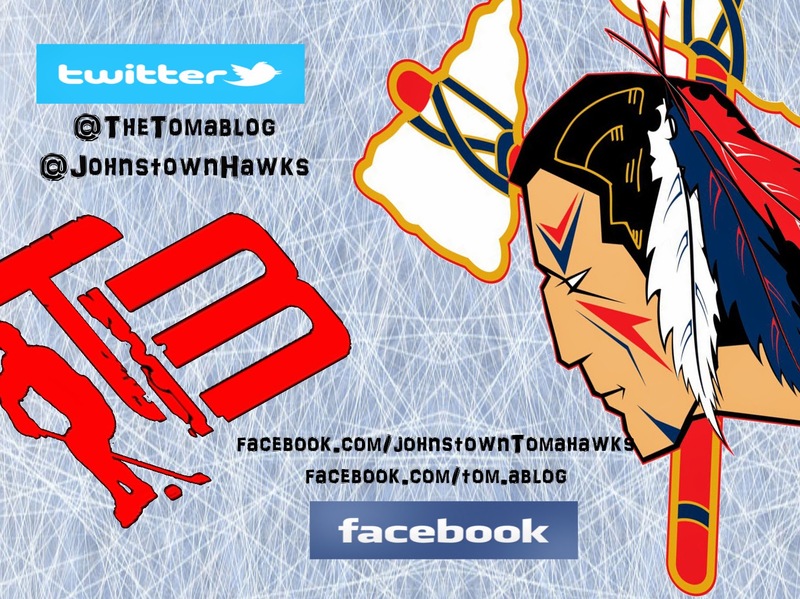 For more information, go to www.johnstowntomahawks.com or call 814-536-4625. Labels: Johnstown Tomahawks, Matt Williams, NAHL. 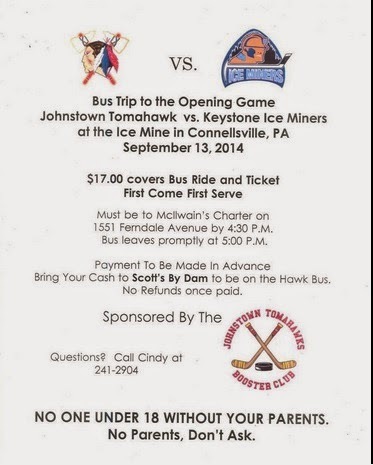 Johnstown Tomahawks open the regular season away at Keystone on September 13th. After that game the team will head to the NAHL Showcase which will then be followed by a few more weekends on the road, before they finally have their home opener on October 25th. If you can't wait that long to see some Tomahawks' hockey in person, the Booster Club has you covered. Labels: Booster Club, Johnstown Tomahawks, NAHL. 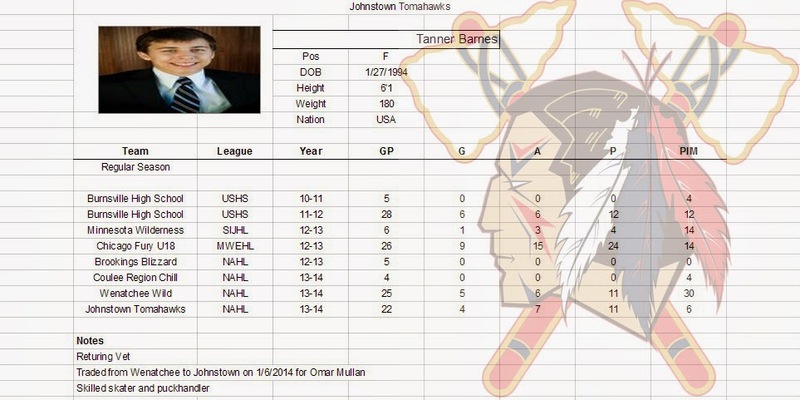 The Johnstown Tomahawks are expected to announce the team's new assistant coach for the upcoming 2014-2015 season. The exact details are not known at this time but the team is expected to name Matt Williams as the new assistant coach. Many Tomahawks' fans will be very familiar with the name Williams as he played with the Johnstown Tomahawks' two seasons ago. Matt Williams was brought in to Johnstown via a trade with the Coulee Region Chill. 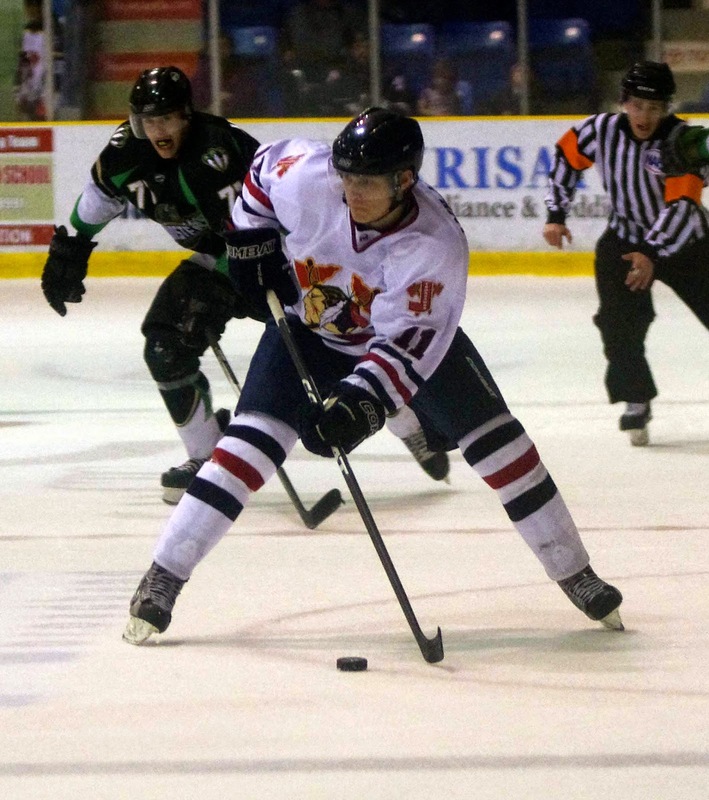 Williams appeared in 14 games for the Tomahawks back in 2012-2013 scoring two assists. Last season Williams competed at the college level. He played one game for Lake Forest College (D3) before transferring to WMU (D3). Williams playing career took a turn last winter when he was diagnosed with Hodgkin's Lymphoma. You can read about his battle here. The Tomahawks' are expected to make the official announcement at some point tomorrow. Williams will replace the position left by Mike Letizia when he was announced as the new head coach of the Tomahawks, replacing Jason Spence. As soon as the team makes the official announcement we will include links and update this post. 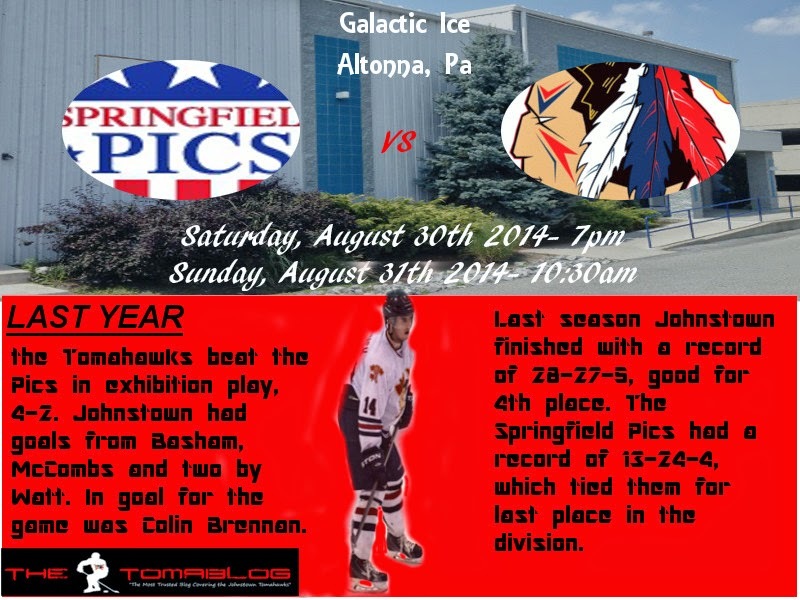 Johnstown takes the ice in two weeks for a pair of exhibition games in Altoona Pa vs the Springfield Pics. The games will take place on August 30th and 31st. For information on those games and to get tickets you can follow this link here. Labels: Brendan Logan, Johnstown Tomahawks, NAHL. Labels: dalton hunter, Johnstown Tomahawks, NAHL. Labels: Dylan Fouts, Johnstown Tomahawks, NAHL. The first player in Johnstown's short history to make the jump from junior hockey to the professional circuit will be former defenseman Kristaps Bazevics. The Wichita Falls Wildcats have made the announcement that Bazevics has signed a professional contract with Pori Assat of the Finnish Elite League (Liiga). Bazevics was part of the Tomahawks' first team back in 2012-13, and played in 30 games with Johnstown before being traded to the Wichita Falls Wildcats for, Johnstown native, Cory Schafer. In those 30 games with Johnstown, Bazevics scored 3 goals, 3 assist, good for 6 points, and also had 37 penalty minutes. Bazevics is predicted to start the season with Pori Assat's junior hockey team, but Bazevics is confident that he'll soon be able to rise to the professional ranks with his hard work, determination, and on ice skill. You can read the whole Wichita Falls' press release here. We will update Bazevics information on the alumni page. Pre-camp preview video from last month. One of the players that's interview and talks about the type of game he likes to play is Zac Robbins. Labels: Andrew Romano, Johnstown Tomahawks, NAHL. The video below was from the Tomahawks' just prior to the final camp that took place last month. In the during the video there is a look at Svoboda. We'll re-post this video again when doing the player profile for Zac Robbins as he is also featured with an interview. Enjoy. Labels: Daniel Svoboda, Johnstown Tomahawks, NAHL. Labels: Johnstown Tomahawks, Luke Lynch, NAHL. You can watch the full video below, but we included this video because it features Tommy Hall starting around the 4:14 mark of the video with his brother Mitch. They share some hockey knowledge with a "hockey terminology" segment, which basically features Mitch taking a lot of cheapshots on Tommy. It's pretty funny and you might learn something. Labels: Johnstown Tomahawks, Josh Bowes, NAHL. Labels: Cam Bleck, Johnstown Tomahawks, NAHL. Labels: Collin Montgomery, Johnstown Tomahawks, NAHL. Labels: Garrison Sanipass, Johnstown Tomahawks, NAHL. In junior hockey, it's never too early to take a look at next season. At this level of hockey, players age out every season, so it's key to be able to scout up and coming talent to take over the roster spots that free up. 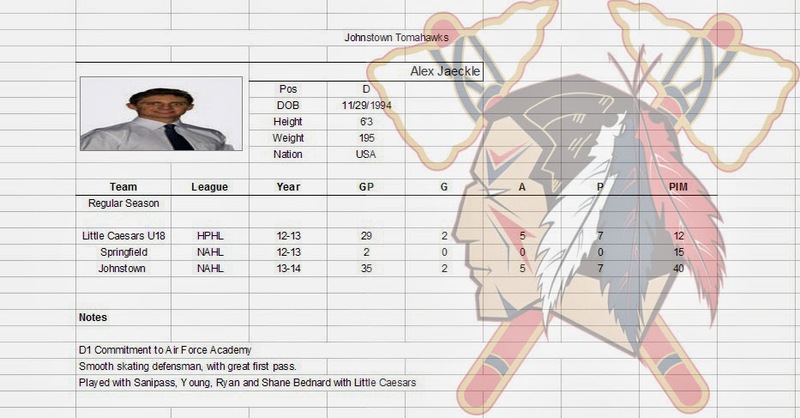 Just a week ago the Tomahawks' settled on their two goalies for the rest of the 13-14 season, Okicki and Young. Okicki is playing in his last junior year, and his spot in the Johnstown lineup will have to be filled by someone new next season. Tendering a player for an NAHL team doesn't guarantee that the player will make that team's roster at the end of training camp, but it does give the player a foot in the door. 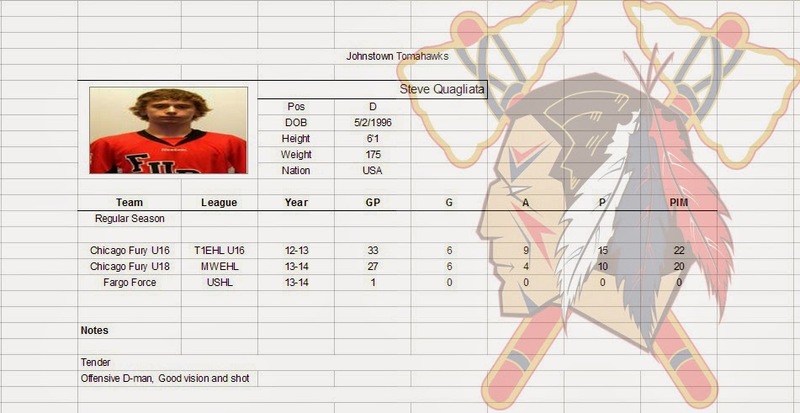 One player that the Tomahawks' have recently tendered is goaltender Jake Gwillim. Gwillim stands at 6ft and is 200lb. He's a 1997 birth year player and is currently playing for the Lansing Capitals of the NAPHL. To continue article, which features quotes from Gwillim click here. Labels: Jake Gwillim, Johnstown Tomahawks, NAHL. Labels: Brett Young, Johnstown Tomahawks, NAHL. 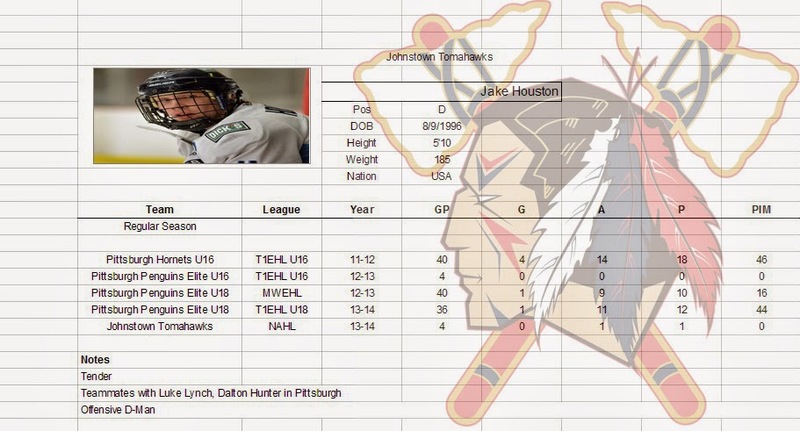 Labels: Jake Houston, Johnstown Tomahawks, NAHL. 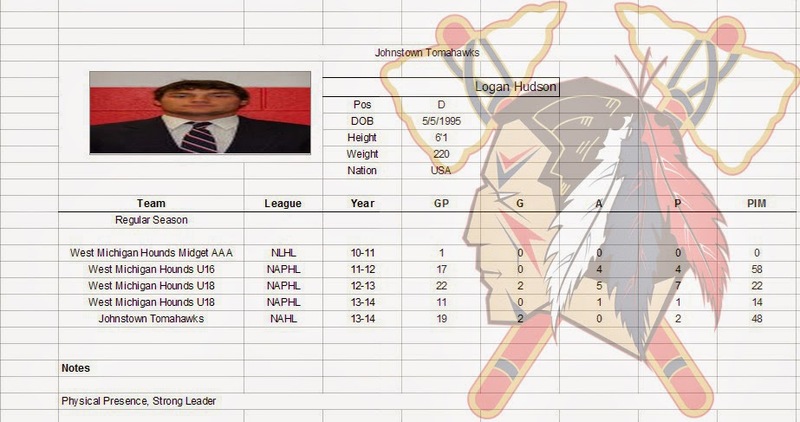 Labels: Johnstown Tomahawks, Logan Hudson, NAHL. 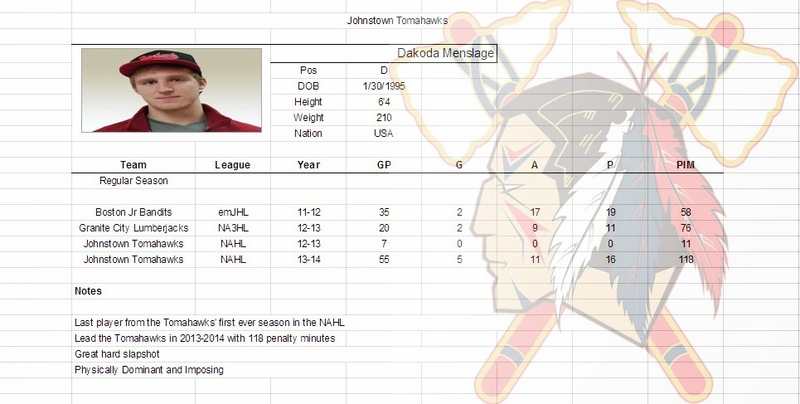 Labels: Dakoda Menslage, Johnstown Tomahawks, NAHL. Last year we wrote an article about Jaeckle, and you can read it here. Jaeckle hasn't played since early January due to injury but hopefully will be ready for the start of the 2014-2015 season. Labels: Alex Jaeckle, Johnstown Tomahawks, NAHL.